Three Public Health technical workshops have been conducted so far. They consisted in a Multisectorial Exercise on Risk Assessment focussed on a specific pathogen. This exercise was designed to foster small group discussion on surveillance integration in the framework of One Health. The first exercise was conducted in December 2015 within the mid-term meeting held at the Institut Pasteur, Paris (France). Participants had discussions on the status of West Nile Virus surveillance in the region in relation to what proposed in the ECDC tool and on the applicability of the ECDC tool in a non EU context. The second exercise was conducted in the context of the first regional meeting of the MediLabSecure project, held in Belgrade in November 2016. This exercise was on the status of Crimean Congo Haemorrhagic Fever (CCHF) in the region and aimed to assess risks at country level with the methodological support of the ECDC RRA Guidance. 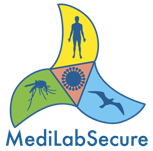 The third exercise was conducted in the context of the second regional meeting of MediLabSecure, held at the Institut Pasteur in Tunis in July 2017. It was designed to foster small group discussion on the status of Rift Valley Fever (RVF) surveillance in the region and to assess level of risk at country level with the support of the methodology applied by FAO for the Risk Assessment for RVF in Niger (March 2017).